Delicious vegan pizza is quick and easy to make. Use a vegan-friendly base (milk-free) such as Napolina; JusRol; M&S pizza base; Sainsbury’s Stonebaked - and it's worth asking in-store at other supermarkets. Some use milk derivatives, others don't! 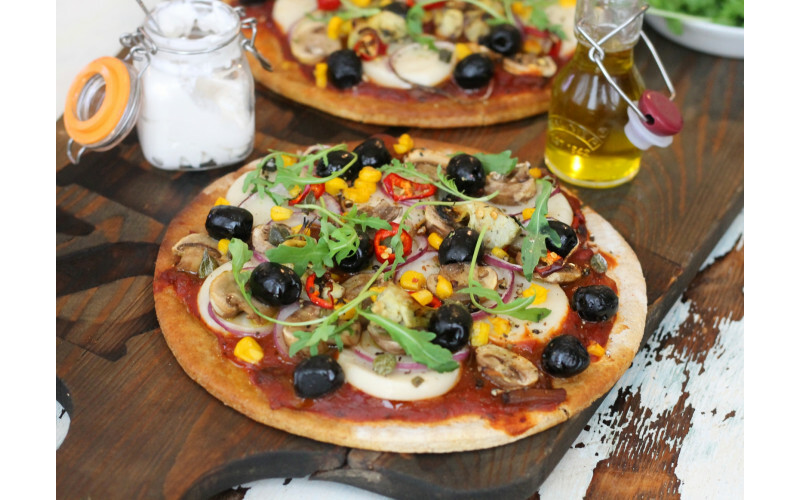 GF options: Amisa, Biona etc sell gluten-free and vegan pizza bases; Goodness Direct, Ocado and other online stores sell them, as do many health food shops. However, read the packets or online ingredients as some GF brands contain egg - or in the case of mixes, require an egg to be added. Eating out: Zizi's, Ask Italian, Pizza Hut and Pizza Express are just a few that offer vegan cheese and all - plus there are lots of independents. Given the rise of vegan numbers we think it's likely that other chains and indies will follow suit soon, so keep up your polite pestering! Some may also do a GF vegan option. 1-2 pizza bases, eg Napolina (see above for others) - 2 bases will serve 2-4 people, depending on how hungry you are! Preheat oven to temperature according to instructions on pizza base packet. (Usually around 200°C/400°F/Gas Mark 6 or upwards). Spread pizza base with topping, then arrange vegetables artistically on top then top with cheese. Bake for 10-15 minutes or until vegetables are just tender and the cheese has melted.